Vitamin C is an important, naturally-occurring nutrient. From preventing colds and flu, rebuilding tissue, bones and blood vessels, to boosting the body’s ability to synthesize calcium, vitamin C is something we need on a daily basis. The following list of foods high in vitamin C will help teach you how to super-charge your diet with a major serving of this essential nutrient. One of the tastiest and healthiest berries on the planet, strawberries are extremely high in vitamin C. Strawberries aren’t just a vitamin c food, however, they’re also high in fiber and the antioxidants responsible for reducing oxidative stress and protecting the heart from excess LDL cholesterol. Just one serving holds about half of your daily vitamin C needs. The Acerola cherry, Malpighia punicifolia, is a small red fruit that is packed with vitamin C! It holds about 65x the amount of vitamin C than an orange. Fresh, raw acerola cherries are available, but if they’re not in season, you can also buy it in powder form. 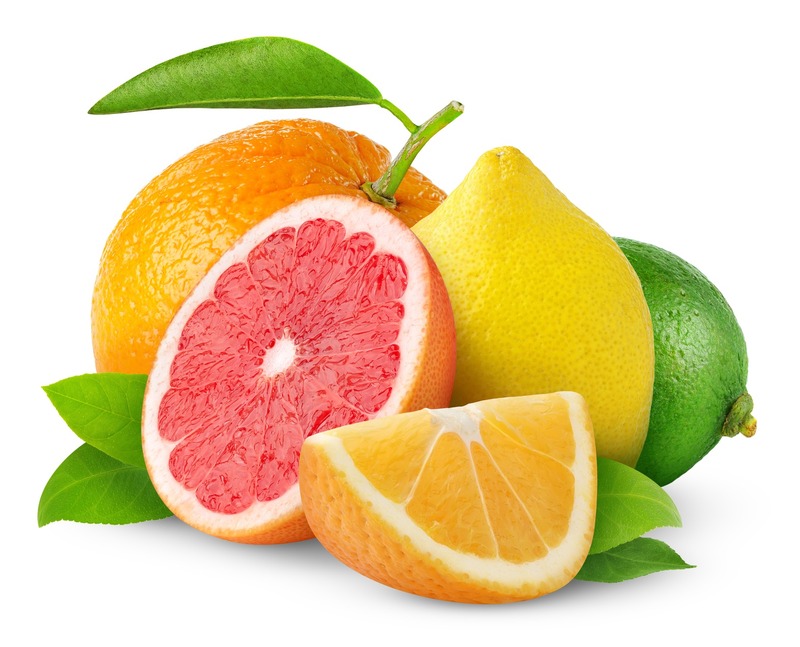 Oranges, grapefruits, lemon and limes! Citrus fruits pop a powerful vitamin C punch. Peel one medium orange for a whopping 70mg. A small glass of OJ has up to 93mg of vitamin C, and a small glass of grapefruit juice has up to 70 mg of vitamin C. Even though oranges are probably the most popular vitamin C food, it doesn’t have the highest amount in it. Papayas are another food high in vitamin C, with one serving holding 100% of your daily needs. Try throwing some in your next smoothie or yogurt. This bright fruit it also high in vitamin A. With its deep dark purple hue, its easy to imagine that this fruit would be high in Vitamin C. Black currants hold around 180mg per serving, as well as plenty of potassium, iron, vitamin B5 and phytochemicals. It may surprise you to learn that this small bright green fruit from New Zealand has more Vitamin C than an orange! They are also high in flavonoids and have as much potassium as a banana. Studies have shown that children who ate these vitamin C-rich fruits experienced stronger respiratory tract than children who did not. Bell peppers are another food high in vitamin C, as well as beta carotene. These colorful veggies have been studied for the cardio-protective health benefits, and have also been shown to prevent cataracts, blood clot formation and may help us reduce our chances of heart attacks and strokes. One half cup of raw red pepper holds over 140 mg of vitamin C. All bell peppers are high in vitamin C, but yellow are the highest and red peppers come in second. This exotic fruit is another great vitamin C food, with one Guava containing over 250 mg. Over twice your daily needs! They are also rich in dietary fiber, folic acid, potassium and manganese, making guavas one of the best super foods to add to your diet. Many supermarkets are now importing these fruits from the tropics, so they are easy to find. While not everyone’s favorite food, Brussels sprouts have a great Vitamin C reputation. One serving of cooked Brussels sprouts has almost 50 mg of vitamin C. Brussels sprouts are also high in vitamin K, folate, vitamin A, manganese, potassium and dietary fiber. However, even with all of these nutrients, it’s still near impossible to convince your kids to give them a try. Many melons have vitamin C. Just one cup of cantelope will provide you with approximately 67 mg of vitamin c, plus plenty of vitamin A and potassium. Additionally, watermelon is another great source of vitamin c, as one serving will give you 112% of your daily needs. Kale, mustard greens, turnip greens, watercress, chard and spinach (as well as most other leafy greens) are all great vitamin C foods to add to your diet. While they all provide different amounts of this essential nutrient, they are all very healthy for you. Kale would be the best choice, as it may have up to 130 mg of vitamin C in one serving. That is one day’s vitamin C needs in a single serving! Another exotic fruit from India, this nutrient-dense super-food is one of the most important medicines in the Ayurvedic pharmacopeia. The fruit is picked, dried and used for its health-boosting properties. It holds one of the most concentrated supplies of vitamin C, so its no wonder it has been valued for thousands of years for its immune enhancing properties. Whether you eat it raw or cooked, you can never go wrong with broccoli. One serving of this little green tree has over 90 mg of Vitamin C. Broccoli is also one of the best detox foods to add to your diet. While not as colorful as some of our other foods high in vitamin C, cauliflower holds its own with this essential nutrient. Just one cup of cauliflower will give you approximately 46 mg, not to mention plenty of vitamin K, folate and dietary fiber. The bright red tomatoes are another common Vitamin C food. Try using sun-dried tomatoes as they are particularly concentrated in this essential nutrient. Just one serving of 100 grams holds over 100 mg of vitamin C. This equals 170% of our daily needs. Many fresh herbs such as cilantro, chives, thyme, basil and parsley are high in Vitamin C. Buy some fresh herbs and sprinkle on every meal. In fact, just one cup of fresh parsley has over 130 mg of Vitamin C. And thyme comes in first, with 160 mg in one cup.